WHAT’S keeping America up at night? For those troubled by sleep issues, particularly parents, Hyland’s is launching a free, 7-Day Sleep Challenge to help consumers of all ages discover the strategies they need to achieve a better night’s sleep, naturally. While safe, natural solutions such as Hyland’s Calms Forté, Hyland’s Nerve Tonic, and Hyland’s Leg Cramps PM can assist those seeking relief from everyday stresses and strains, Hyland’s appreciates that many factors influence and help improve sleep. 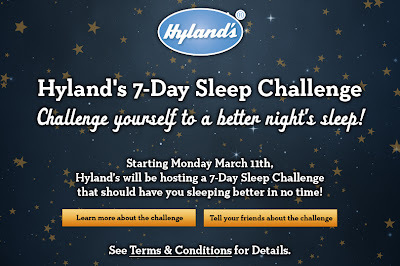 That’s why Hyland’s 7-day Sleep Challenge will be sharing 7 days of suggestions and strategies that consumers can use to reassess their sleep environment and habits, so they’ll be sleeping better in ju st one week. WHY: Sleep is a big issue for many Americans. According to the National Sleep Foundation, 43 percent of Americans between the ages of 13 and 64 say they rarely or never get a good night's sleep on weeknights. Sixty percent experience disruptions to their sleep every night, or almost every night. While financial concerns related to the economy play a large part in keeping adults up at night, according to Mintel, concer n over the potential side effects of prescription pharmaceuticals is affecting their willingness to try traditional sleep aids. As a result, there is an increased interest in natural, over-the-counter alternatives. WHEN: Timed to launch the day after clocks ‘spring forward’ for Daylight Savings Time, the 7-Day Challenge beings on Monday, March 11 and runs through Sunday, March 17. Participants can register on Facebook for free and be entered for a chance to win one of 7 gift baskets* of rest and relaxation products including Aura Cacia aromatherapy, Theo Chocolate, Mack’s earplugs, Choice Tea, Lily’s Sweets, Madhava organic honey, SkinFare, and Hyland’s.